" Grenzfurthner's outspoken, swiftly flying little flick is the must-see indie of 2014, as far as I'm concerned. 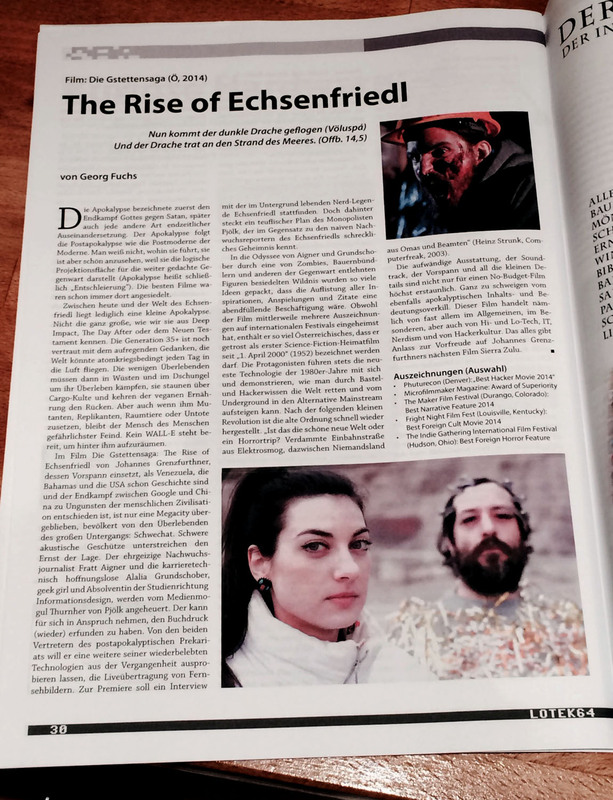 Everyone, be they intellectuals, political-types, or simply those that love great blackly comic, sensual horror, will fall madly in love with 'Die Gstettensaga: The Rise of Echsenfriedl'. See it, as soon as possible, and I promise you'll never be bored at the movies again." " It's rare to hear a movie audience burst out with such delightful laughter. A brilliant creation that redefines the term 'horror.'" "The best kind of low-budget filmmaking... it is like watching an absurdist play by Beckett, if Beckett decided to work on the Mad Max franchise." 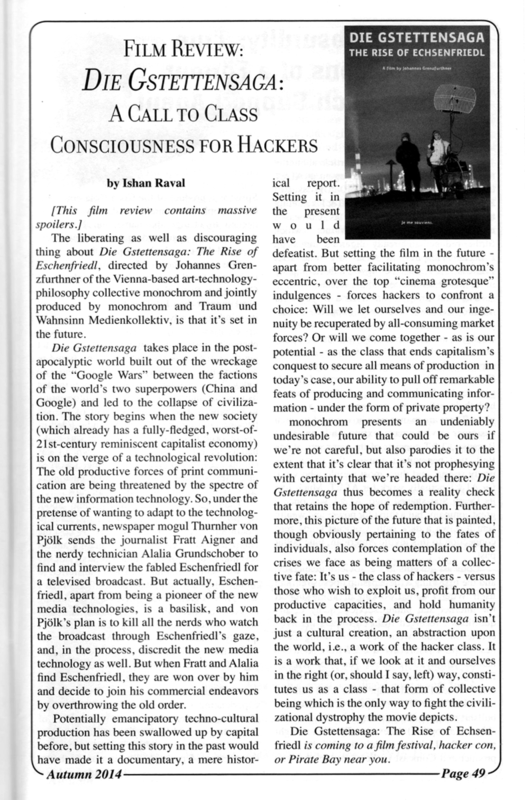 "Setting the film in the future forces hackers to confront a choice: Will we let ourselves and our ingenuity be recuperated by all-consuming market forces? Or will we come together - as is our potential - as the class that ends capitalism's conquest to secure all means of production?" "I'm overenthusiastic about Gstettensaga - because it distracts the Hollywood canon, because it is such a genre bender, a satiric H bomb, going for the unexpected dialectical turns of current history." "A pure nerdy underground gem between Monthy Python and the Frêres Denis." "A mad post-collapse satire of information culture and tech fetishism, in a weird sort of melding of Stalker, Network, and The Bed-Sitting Room." "The old world has been reduced to ashes by the earlier beacons of hope (China stands for Maoism and Google for alternative culture). All that remains are stretches of land governed by idiocy and dialects. As Marxists, the people from Monochrom know that only the revolution can free us from capitalism. And yet the revolution is no more alive than unicorns are." "Forces us to think deeper about the fact that much of today's romanticized revolutions often go eerily hand in hand with the development of digital capitalism. Few films today, if any, manage to do such a feat." "Hackploitation art house... reimagining the makerspace as grindhouse ... the Gstettensaga's fascinating cinematic pastiche is more than just a firework of rhizomatic intertextuality, a symptom of the depthlessness of postmodern aesthetics or excessive enthusiasm for experimentation in the field of form." "Gstettensaga is a lot of fun -- and it will leave you with a refreshingly bitter aftertaste." ORF III / March 10, 2014 as part of "ORF III Artist in Residence." 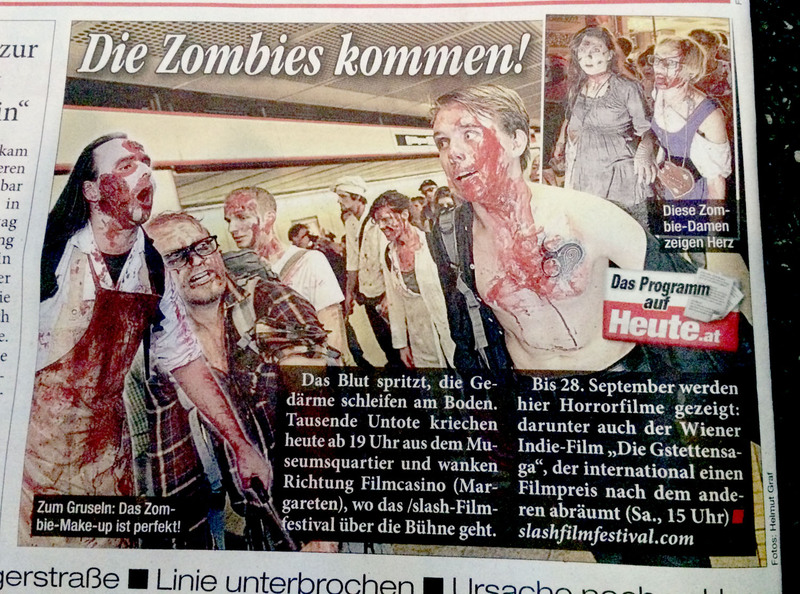 Breitenseer Lichtspiele, Vienna / March 7, 2014; 8:30 PM / Facebook event. Mein Bezirk / komm.st (teaser). France Culture / Politique de l'algorithme. 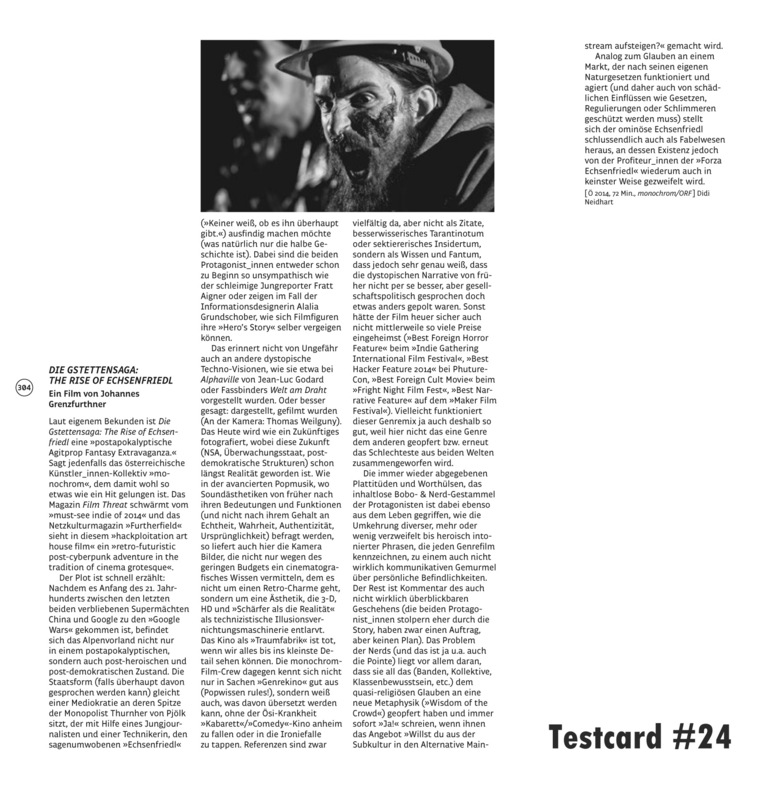 Mein Bezirk / komm.st (review). A life in 24 fps.